Published July 10, 2013 By Guest This post may contain affiliate links. Regardless, I only recommend sites I've researched and/or used and trust. Many bloggers and website owners, new and veteran, find VigLink a little confusing and intimidating. Many wonder why they would use such a thing at all. There are numerous benefits that come from installing VigLink on your online properties. Let’s take a look at my top 10. Some merchants do not make it easy to link to specific products or pages. Rather than sending your reader on a wild goose chase and potentially missing a sale, VigLink can convert any link to an approved merchant page or product on command. Maybe that cool find is not worthy of an entire blog post. Or maybe you are publishing on a site other than your own that will allow you to include affiliate links. Wrap those links and share them on other websites, social networks and more. With the exception of Amazon.com, VigLink provides an opportunity for those in a state where merchants have turned away affiliates to still earn an income through this avenue. Even those intimidated by code can easily install VigLink on their websites. There is even a plugin available for those using WordPress. You do not need to fear losing control over your website or earnings. You control the settings and decide how much or how little VigLink monetizes your content. There are times when you may miss an opportunity for a sale. Perhaps the merchant didn’t have an affiliate program at the time of publishing. Maybe you forgot to include your link. VigLink will come along behind you, even months or years down the road, and make sure those opportunities are covered. Optimize your earnings by staying on top of what’s converting and what’s not. VigLink reports will allow you to see what’s clicked and where, even if it isn’t an affiliated link. Many website owners like to keep their links looking clean. Many worry that readers won’t trust a link that doesn’t clearly show where they will be heading next if they click. VigLink allows your link to Staples.com to look like Staples.com. Two main concerns of profit bloggers are staying in the good graces of Google and the FTC. Google does not want compensated links passing PageRank to advertisers. VigLink stated back in February that Google handles their links correctly and they do not pass PageRank. In the case of tightening disclosure requirements from the FTC, VigLink gives you the option to include a disclosure whenever they insert a link. Not only can VigLink boost your income, it can also save you a lot of time. You no longer need to wait to publish a piece while waiting for approval as an affiliate. You also no longer need to spend precious hours updating links when an affiliate program closes or moves to another network. That’s VigLink’s job. 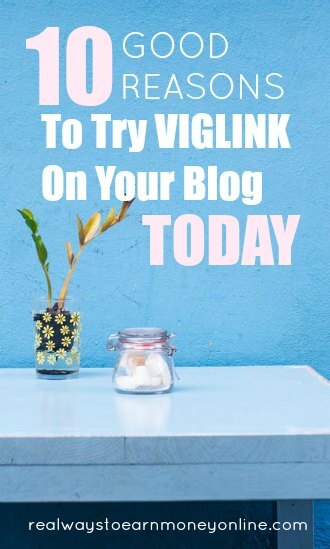 Do you use VigLink on your blog? What have you found to be the biggest benefit? Angie Nelson has been an online business owner since 2007. Today she balances several successful online ventures and still manages to share her passion for home business with others on her blog The Work at Home Wife. Angie is also the author of How to Make Money Blogging, a how-to guide which takes an in-depth look at the many ways to create an income as a blogger.